Is there by any option you can fix so you dont go to the "thanks for youre submission" site thats powered by jotform, i want to get redirected to my index page on the site. You can assign your own Thank You page in your JotForm form. Just click the Thank You button found under the Setup & Embed tab of your toolbar. 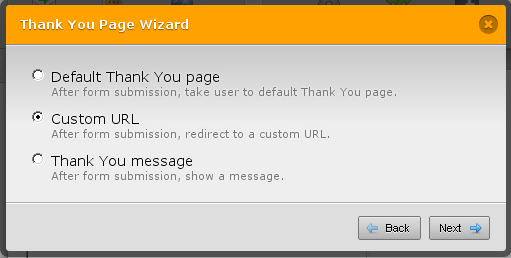 The Thank You Page Wizard appears. Please select Custom URL. Then enter the URL of the webpage that you want to become your Thank You page. Please follow the above steps and let us know if you need further assistance. Thank you for using JotForm!